Please call Bluegreen Travel Services at 800.459.1597 to learn about similar tours. Single accommodations may be available; call us for rates. All guests on this tour must be age 21 or older. Only 10 doubles left on this adventure. Book now! Learn More by Watching our New Recorded Webinar! Hear more details about Bluegreen’s California Wine Country & the Redwoods tour. In just about an hour you’ll discover why you should join us on this 2019 Owner Adventures vacation. Savor the acclaimed wines of Napa Valley and behold the majesty of the world’s tallest trees on this motorcoach tour of Northern California. The adventure starts in sophisticated San Francisco with a Welcome Dinner and sightseeing of the area’s most iconic attractions, including the Golden Gate Bridge and Fisherman’s Wharf, followed by lunch in Chinatown. Then head into California’s wine country for a tour of the wine caves and tasting at the Gloria Ferrer Caves & Vineyard and sample wines straight from the barrel at the Ravenswood Winery. Relive the days of elegant rail travel aboard the luxurious Napa Valley Wine Train for a journey through the lush valley and an elegant lunch, followed by a visit to the Robert Mondavi Winery. Travel north along the spectacular Avenue of the Giants, the famed road that winds its way through stands of redwoods. You’ll even see an 1,800-year-old tree! Take a tour of the grand Carson Mansion, once the home of a West Coast lumber baron, and spend time in Redwood National Park. You can’t help but feel downright small among the trees in this stunning preserve; redwoods here can easily reach heights of 300 feet. Learn about the park at the Visitor Center with its numerous exhibits or explore on your own. As you return to San Francisco, stop for a tasting of the fine Grand Reserve Collection at the Kendall-Jackson Wine Estate and Gardens and toast your Northern California adventure with your fellow travelers at a Farewell Dinner in San Francisco. Welcome to San Francisco, gateway to your Northern California adventure. You will be transported to your hotel near Fisherman’s Wharf. Enjoy time at leisure before joining your Tour Director, Bluegreen host and fellow adventurers for a Welcome Dinner this evening. Dinner is included today; overnight in San Francisco. This morning take a sightseeing tour of San Francisco. See Golden Gate National Recreation area, including the iconic Golden Gate Bridge and the Presidio; Fisherman’s Wharf; Union Square and more. Then explore historic Chinatown on a walking tour. Discover dim sum teahouses, see how fortune cookies are made, wander back alleys and peek into temples in this historic neighborhood. Afterward enjoy lunch at a typical Chinatown restaurant. This evening is free for you to explore more of this vibrant city on your own. Your Tour Director will have suggestions for additional sightseeing, shopping and dining. Breakfast and lunch are included today; overnight in San Francisco. This morning cross the Golden Gate Bridge and head to California’s Wine Country for a guided tour of the wine caves and a tasting at the Gloria Ferrer Caves & Vineyard, makers of award-winning sparkling wines in Sonoma. This afternoon get the full flavor of Sonoma’s Ravenswood Winery as you walk through the Old World vineyards to see the vines up close and learn firsthand about the unique vinicultural practices at Ravenswood. Wind your way back to the barrel room for a sneak peek of “what’s to come” and sample wines straight from the barrel. Dinner will be at a local restaurant this evening before the group travels on to Napa. Breakfast and dinner are included today; overnight in Napa. Today board a luxurious Pullman lounge car and enjoy a relaxing three-course gourmet lunch on the famous Napa Valley Wine Train. Relive the days of elegant rail travel as you journey through the lush Napa Valley. Meals crafted by Executive Chef Donald Young are prepared in a specially fabricated kitchen car located immediately adjacent to each dining area. After you return to Napa, visit the Robert Mondavi Winery in Oakville for a wine tasting. This first-growth vineyard is renowned for producing some of the finest Cabernet Sauvignon wines in the world, as well as for its Sauvignon Blanc grapes, from which Mr. Mondavi crafted his signature wine, Fumé Blanc. Breakfast and lunch are included today; overnight in Napa. This morning travel along the spectacular Avenue of the Giants, a quiet two-lane road that winds through some of the world’s most amazing scenery, stands of ancient redwood trees. See an 1,800-year-old redwood here! Then enter Eureka, California’s lumber center, where you will see the grand Carson Mansion, the most photographed example of Victorian architecture in the world. It was once the home of a West Coast lumber baron. Enjoy a group dinner this evening. Breakfast and dinner are included today; overnight in Eureka. Visit Redwood National Park, home to the world’s tallest trees. You can’t help but feel small in this stunning preserve, where soaring redwoods line up like living skyscrapers. You’ll have time at leisure to walk and explore the park. Then visit the Thomas H. Kuchel Visitor Center for further discovery. It’s the largest of five visitor centers in Redwood National and State Parks, with numerous exhibits and a video on redwood ecology, a bookstore and access to a sandy beach. Breakfast and lunch are included today; overnight in Eureka. On the return trip to San Francisco, stop at the Kendall-Jackson Wine Estate and Gardens in Fulton, the only American winery to share ownership in a French stave mill. Their commitment to aging and fermenting in French oak barrels has helped Kendall-Jackson deliver America’s favorite Chardonnay since 1982. Enjoy a flight of wines from the Grand Reserve Collection during your tasting. Continue to San Francisco and celebrate the success of your trip with a special Farewell Dinner at a local restaurant tonight. Breakfast and dinner are included today; overnight in San Francisco. Your California Wine Country & the Redwoods adventure ends this morning. Breakfast and your transfer to the airport are included today. Call 800.459.1597 to Book Your California Wine Country & Redwoods Tour Today! *TRAVELER PLUS DOUBLE POINTS FOR 2019 OWNER ADVENTURES OFFER TERMS & CONDITIONS: Make a new booking for select 2019 Owner Adventures vacation packages from October 11 to December 31, 2018, and get double value for your annual, unrestricted Points toward the Owner Adventures package price (1 Bluegreen Point equals 8 cents; 5,000 Points equals $400). Offer applies to California Wine Country & the Redwoods, March 28-April 4, 2019. In order to apply annual, biennial, borrowed or rented Bluegreen Vacations Points for payment, Owner Adventures price, including base fare and taxes, must be a minimum of $500 per person for the first and second passengers in a room or cabin, for a total minimum fare of $1,000. Benefit applies only to active Traveler Plus members. Offer is combinable with Past Guest and Galapagos Airfare promotions. New bookings only. Based on availability. Additional terms and conditions may apply. Offer may be withdrawn at any time. **TRAVELER PLUS POINTS-FOR-TRAVEL BENEFIT TERMS & CONDITIONS: In order to apply any combination of annual, biennial, borrowed or rented Bluegreen Vacations Points for payment, Owner Adventures vacation price, including base fare and taxes, must be a minimum of $500 per person for the first and second travelers in a room or cruise cabin, for a total minimum fare of $1,000. Benefit applies only to active Traveler Plus members. Prices based on availability, per person double occupancy and subject to change without notice. Includes accommodations; some meals; on-tour motorcoach transportation; guided sightseeing; Napa Valley Wine Train excursion; admission to attractions; airport transfers in San Francisco on March 28 and April 4; hotel luggage handling; gratuities for tour manager, local guides and driver; and taxes. All guests on this tour must be age 21 or older. Fares shown are in U.S. dollars for new reservations only and are subject to availability. Not included: airfare; airline fees; airport or departure taxes; vacation insurance; gratuities for hotel housekeepers; alcohol, food or beverages outside of the contracted Globus menu as presented at a hotel or restaurant; optional excursions; vacation insurance; and any incidental charges. Cancellation fees apply. 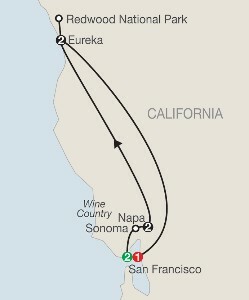 Price is per person based on double occupancy and includes accommodations; some meals; on-tour motorcoach transportation; guided sightseeing; Napa Valley Wine Train excursion; admission to attractions; airport transfers in San Francisco on March 28 and April 4; hotel luggage handling; gratuities for tour manager, local guides and driver; and taxes. All guests on this tour must be age 21 or older. Reservations must be booked by November 23, 2018. Nonrefundable, non-transferrable deposit of $500 per person is due at time of booking. Final payment due by December 14, 2018. Prices, additional fees, itineraries and availability are subject to change without notice. Certain terms, conditions, and restrictions may apply. Please call us at 800.459.1597 for additional information. Fares shown are in U.S. dollars for new reservations only and are subject to availability. Not included: airfare, vacation insurance, government taxes and fees, gratuities for hotel housekeepers, alcohol, beverages, food outside the contracted Globus menu as presented at a hotel or restaurant, optional excursions, baggage fees and all other items of a personal nature. Great Vacation Destinations, doing business as Bluegreen Travel Services, is located at 12400 S. International Drive, Orlando, FL 32821. Great Vacation Destinations is registered with the State of California as a Seller of travel Reg. No. 2068362-50 (registration as a seller of travel does not constitute approval by the State of California); Washington Seller of travel Reg. No. 602-283-711; and registered with the Airlines Reporting Corporation (“ARC”) number 15-72225-4. In the event of a conflict between Globus’ Details of Participation and Great Vacation Destinations’ Details of Participation, Great Vacation Destinations’ Details of Participation shall govern.